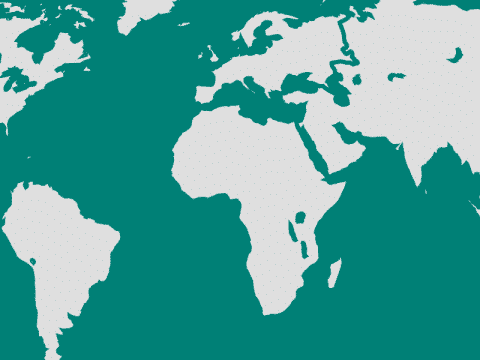 The 21st cen­tu­ry is already now the cen­tu­ry of urban­i­sa­tion. 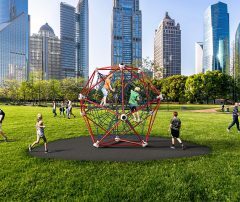 In order to be able to guar­an­tee suf­fi­cient space for recre­ation, play and exer­cise in the future, inno­v­a­tive solu­tions are more in demand than ever before. 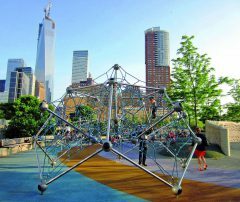 The devel­op­ment of var­i­ous instal­la­tion meth­ods for rooftop play­grounds by the Berlin Cre­ative Cen­ter allows for build­ings with a mul­ti­func­tion­al char­ac­ter. 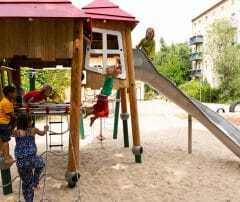 Despite increas­ing urban den­si­fi­ca­tion, new urban spaces can be cre­at­ed in this way. 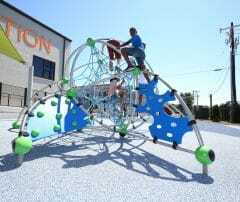 Also in the area of indoor play­grounds and hous­ing con­struc­tion, we offer cus­tomised solu­tions that fit seam­less­ly into your desired archi­tec­tur­al design in terms of design and tech­nol­o­gy. Let your­self be inspired! 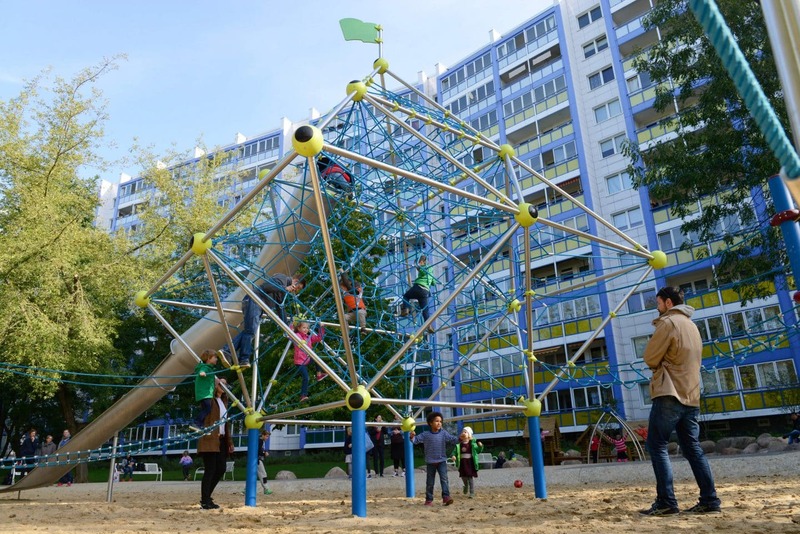 In Lichtenberg, the district the most people are moving to in Berlin, a playground has been created in cooperation with the landscape architecture firm Bobsien on behalf of the WGLi (Wohnungsgenossenschaft Lichtenberg eG. ), which is also a football pitch. 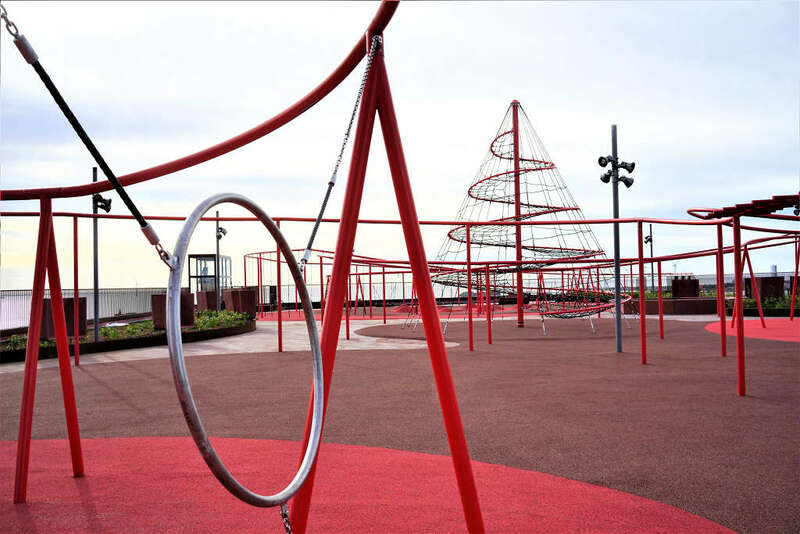 Originally, a playground was to be built on the site where a classic football pitch already existed. 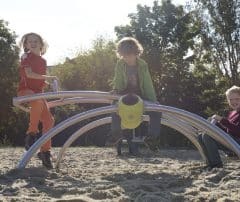 Even though this was very popular with the kids in the neighbourhood, it was also used as a kind of compensation for the lack of play equipment. 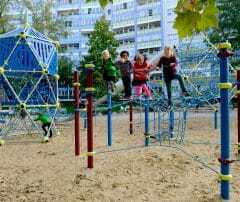 The children climbed the fence bordering the football pitch. 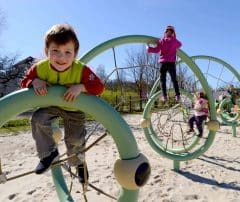 The size of the existing project area was not sufficient to install new playground equipment in addition to the existing football pitch. 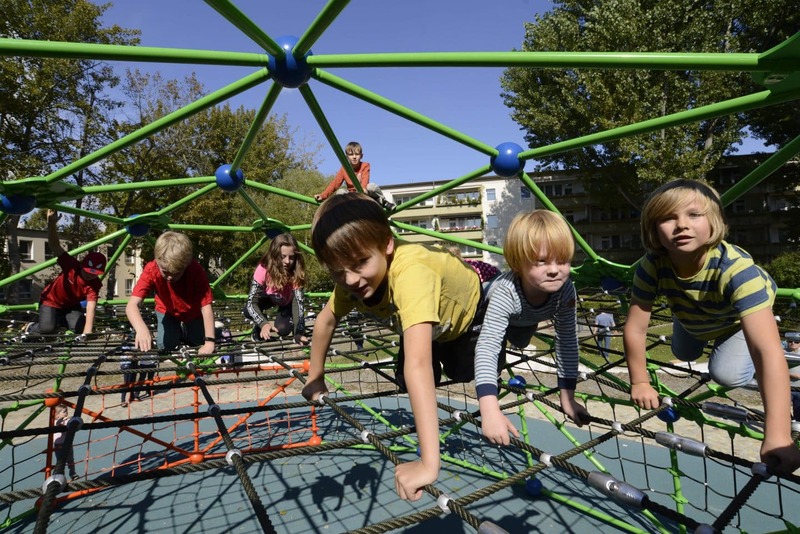 The solution was to opt for a playground that combines football and safe climbing in one area: the Geoarena. 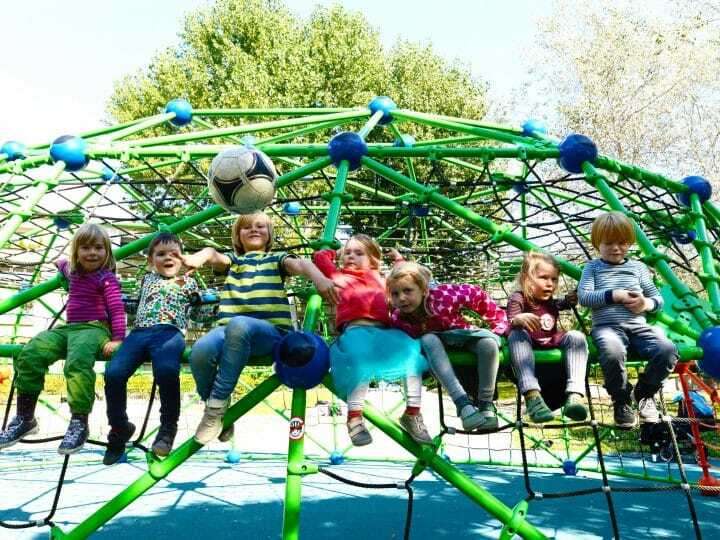 The Geoarena is a unique playground in the form of a dome with a football pitch inside. Football enthusiasts get their money's worth here. 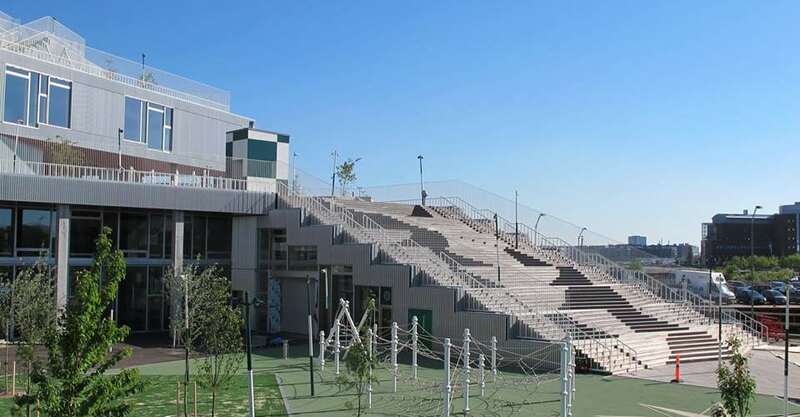 At the same time the Geoarena can be climbed from the outside. 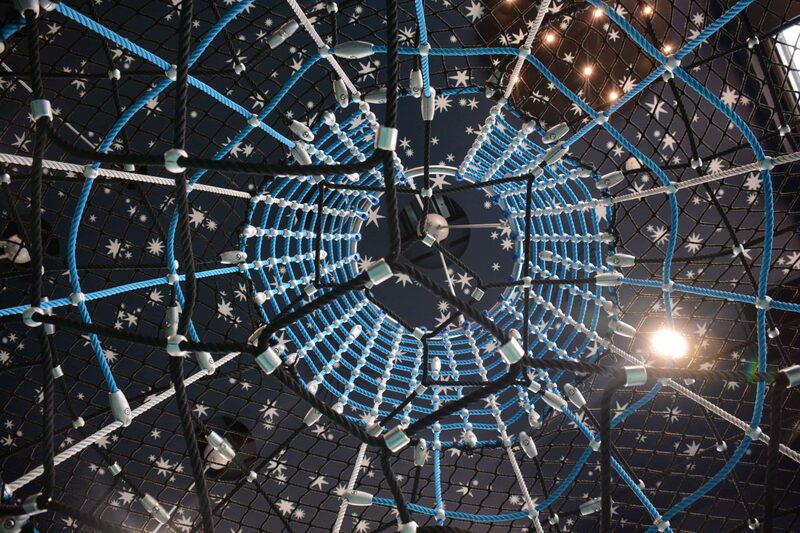 The Geoarena is a 4.30 metre high dome in a geodesic form, made transparent by mesh elements. 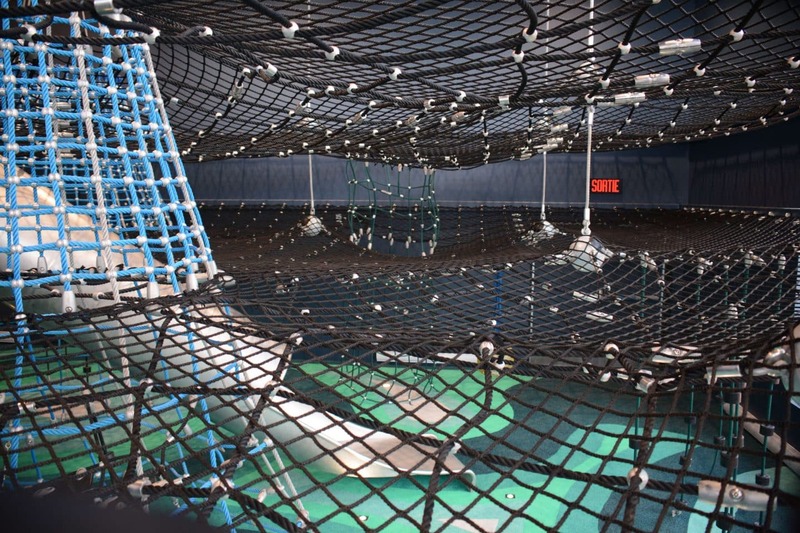 The Frameworx system of Berliner Seilfabrik, consisting of steel tubes and connecting balls, serves as the basis for the net elements. 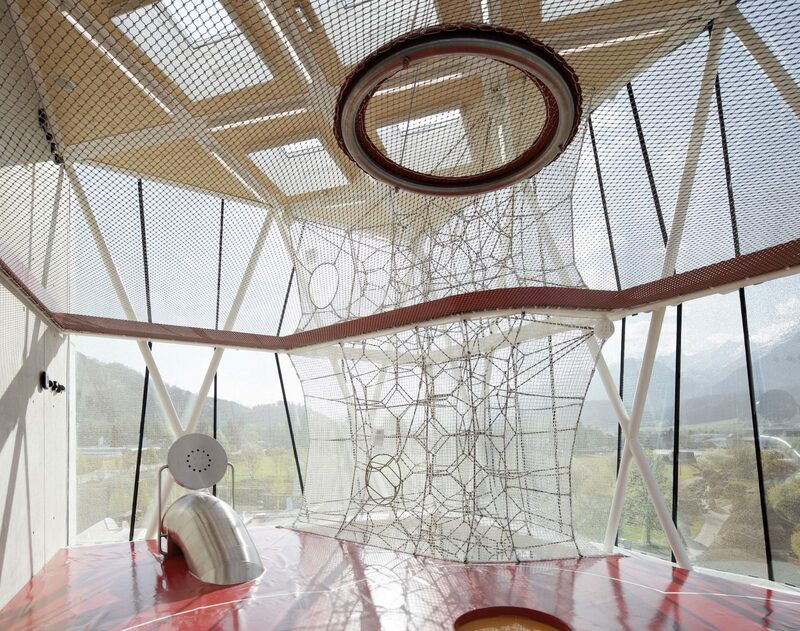 An additional special feature in the upper part of the dome is an intermediate ceiling in the form of a planar net. 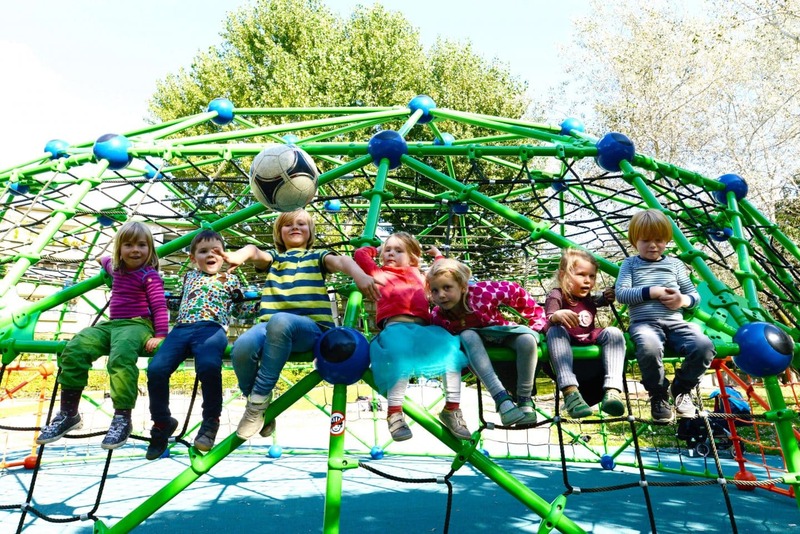 Likely the most popular places to watch the football match at close range and also an additional play function in the climbing frame. The colour scheme of the Geoarena is adapted to the surroundings. 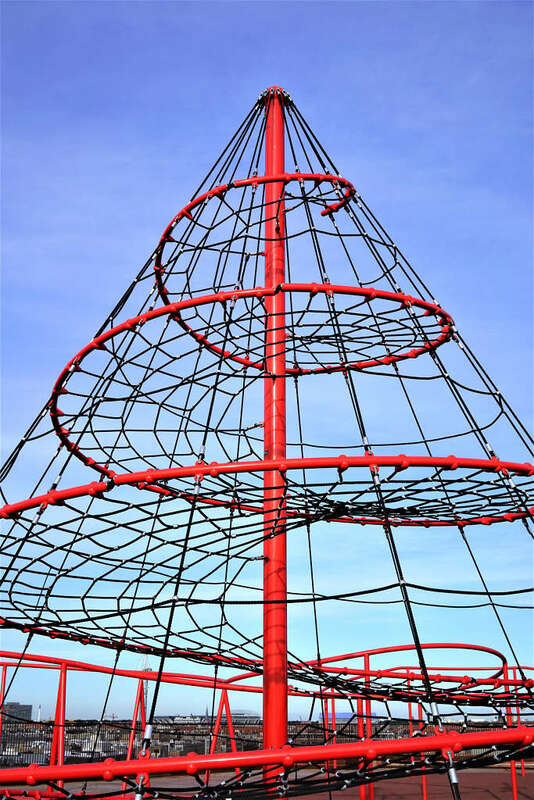 While the blue balls match the blue of the sky, the green steel pipes pick up on the vegetation of the surrounding bushes, shrub and meadows. 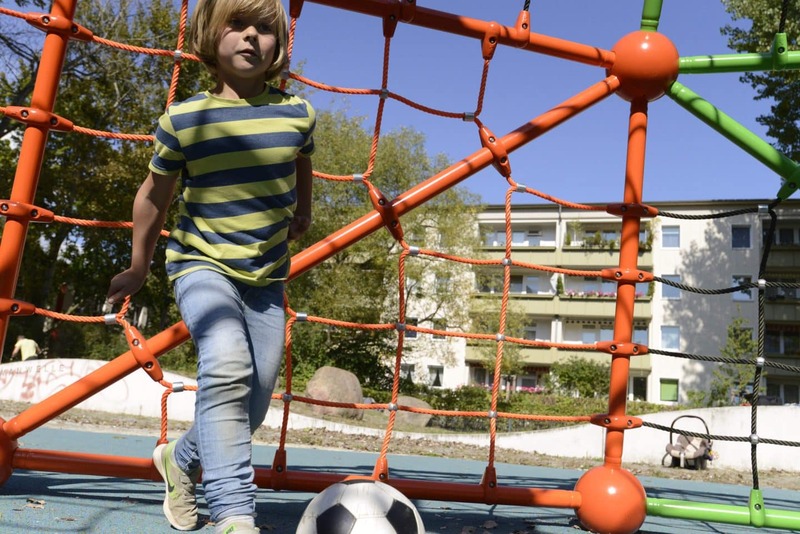 The football goals are marked by two opposite orange surfaces. 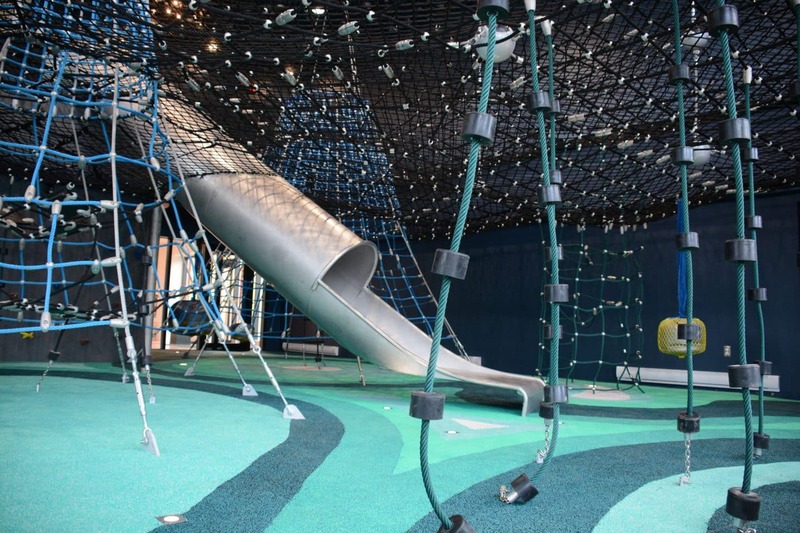 In the Geoparc de Percé in Quebec, Canada, the new indoor playground recreates the surrounding geographical features, characterised by massive cliffs and impressive rocky islands. 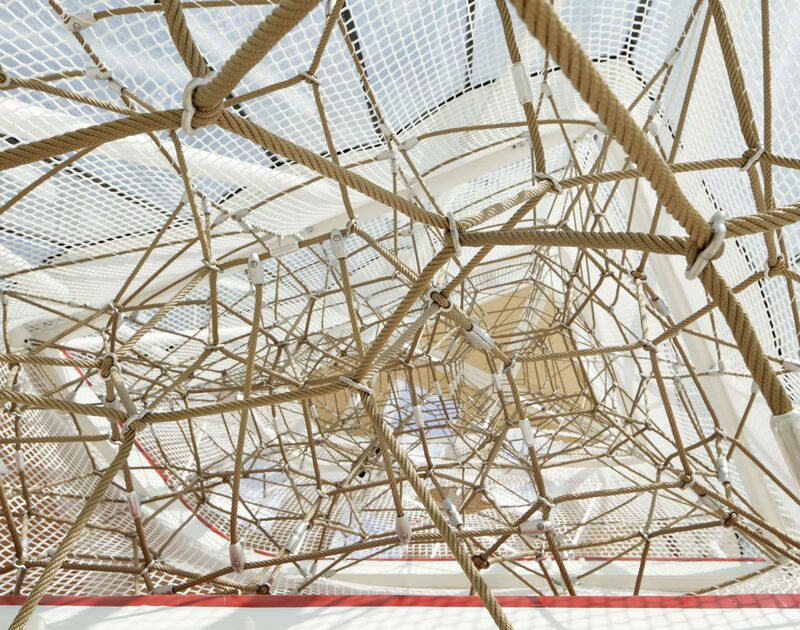 From the mind of the architects Groupé BC2 and realized by Berliner Seilfabrik, you can now dive into a water world of various net landscapes. 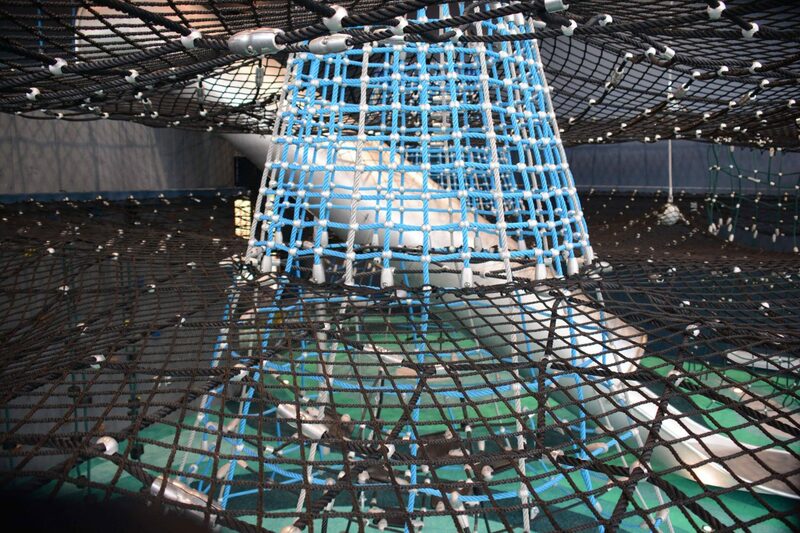 Two black planar nets, stretched across the entire room, split it into three levels and create the sky above, the marine world in the middle and the seabed at the bottom. 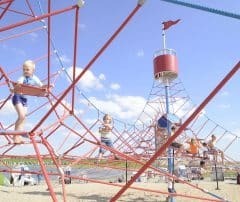 The three levels are connected by three conical net funnels. You can reach all three levels by climbing. 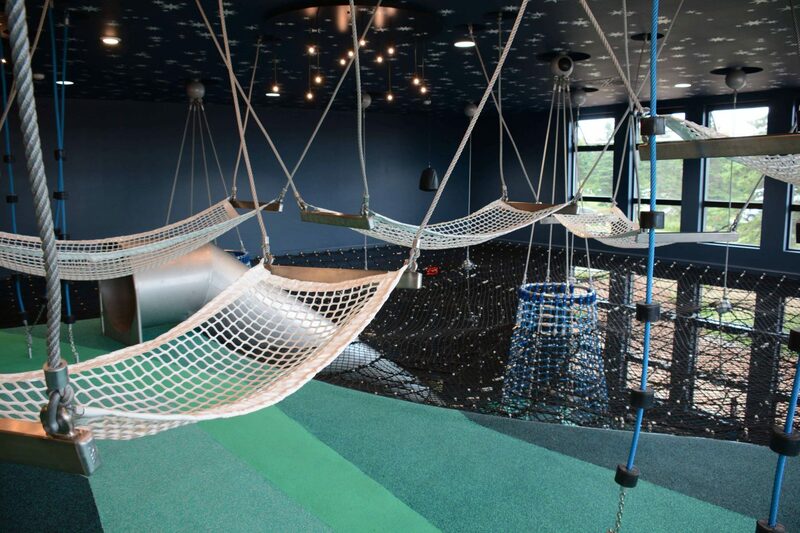 Hammocks are located directly under the ceiling on the top level. So you float like on clouds above the “sea”. 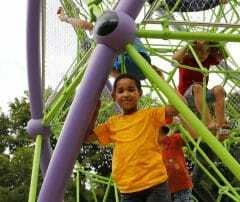 Climbing ropes and other play elements are used on the various levels. 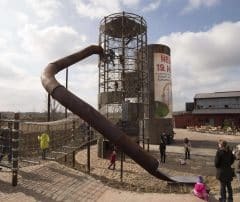 A tunnel slide leads from the top directly to the bottom. The playground "Park'N'Play" towers in bright red above the harbour scenery of Copenhagen. 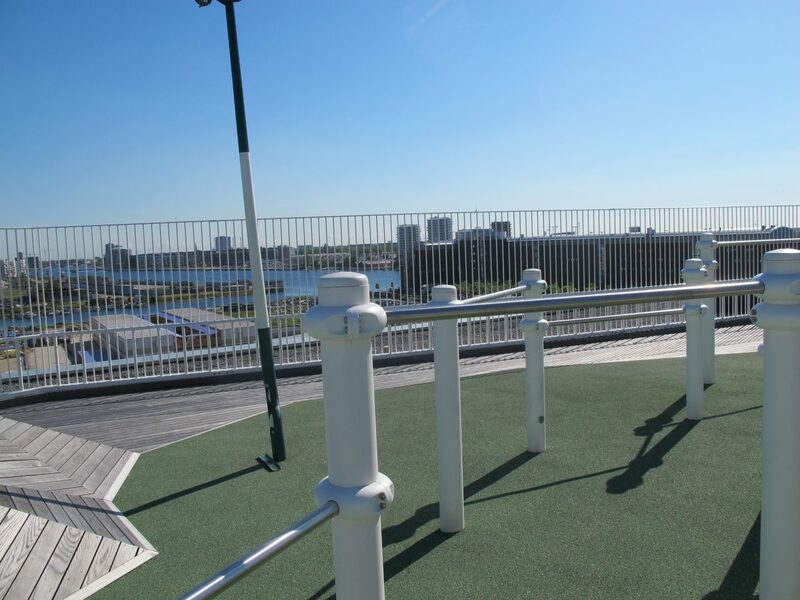 Its special feature is that it is located 24 metres above sea level on the roof of a multi-storey car park, thus setting new standards in understanding the design of public spaces. 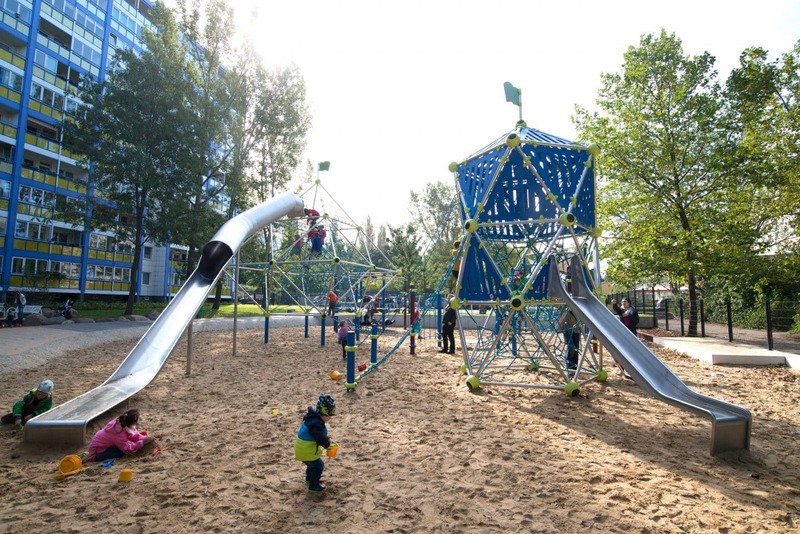 The challenge of this project was to create centrally located parking facilities that would fit in perfectly with the surroundings of the modern Nordhavn district. 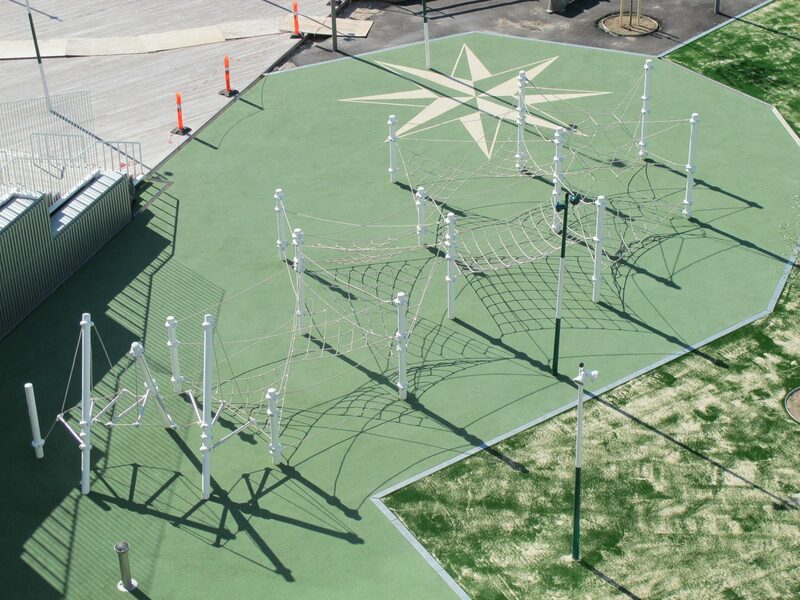 The installation of a roof playground has created a multi-functional multi-storey car park. 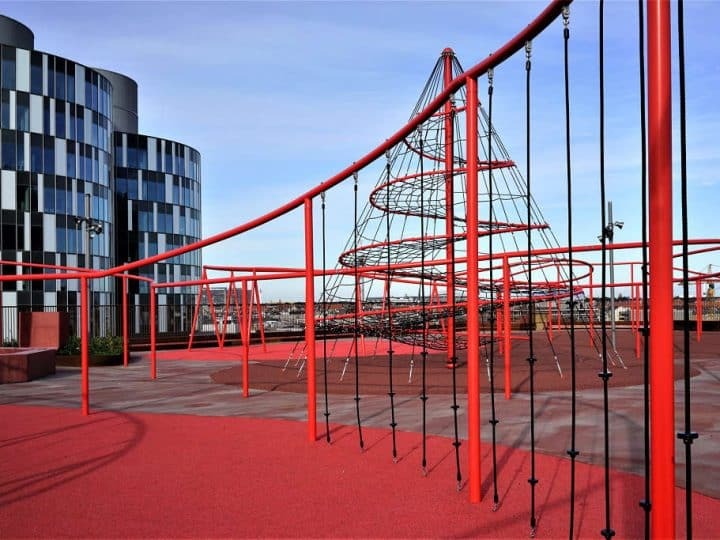 The red handrail of the staircase on the façade of the multi-storey car park continues on the roof and is integrated like a "red thread" into the most diverse play structures, serving as a supporting element for swings, benches and dangling possibilities. 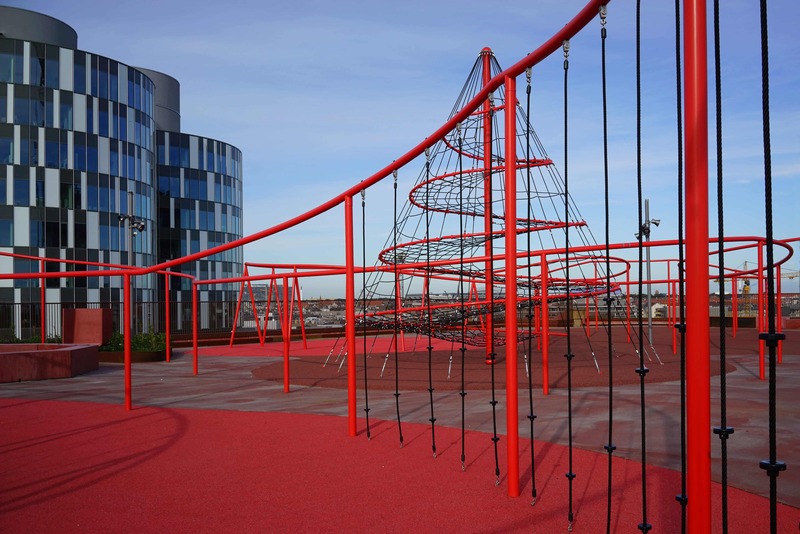 The highlight of the rooftop playground is a climbing pyramid by Berliner Seilfabrik which is nearly 8 metres high. 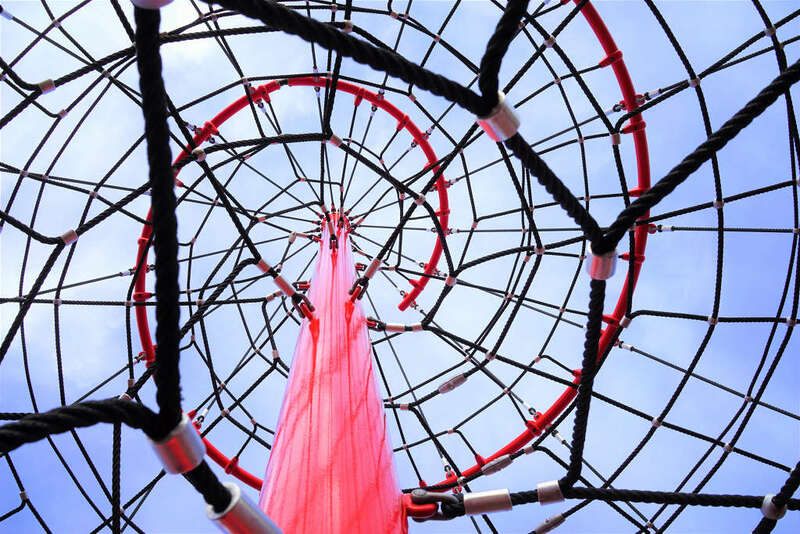 A black planar net serves as the ascent, which spirals around a central mast and becomes narrower and finally pointed the higher you go. When constructing the pyramid, the existing roof structure was to be used as an anchor without damaging the properties of the roof’s cladding. The solution lay in the high number of 16 anchoring points in total. 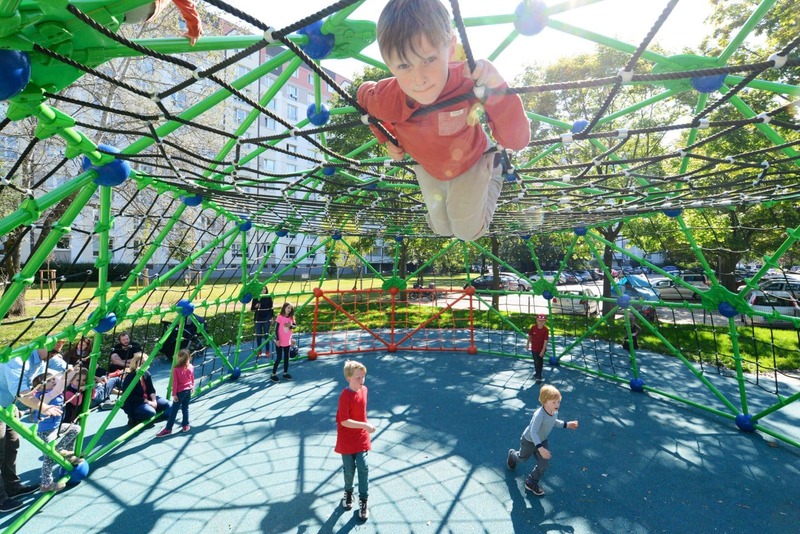 This allows the tensile forces to be distributed in the optimal way and the roof construction was only minimally disturbed. 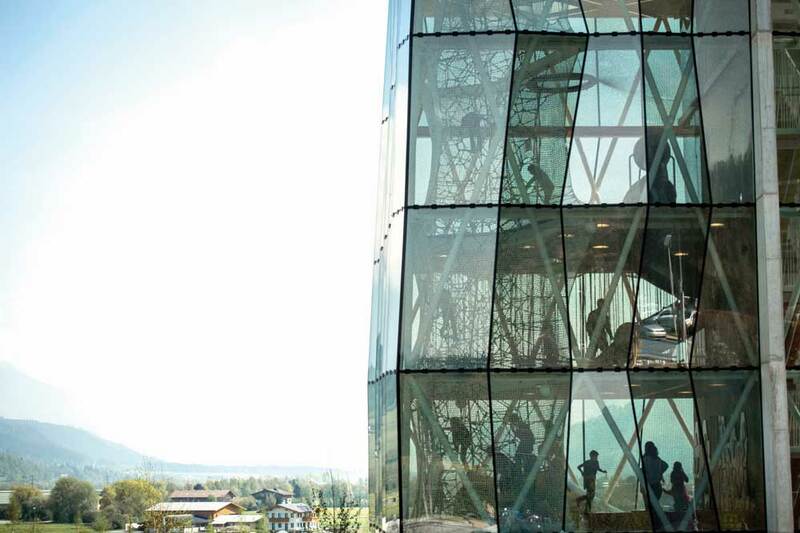 The Swarovski Crystal Worlds in Wattens is one of the most-visited tourist attractions in Austria. 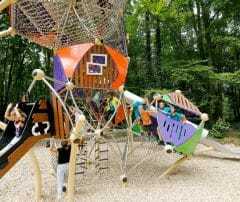 In 2015, the adventure park was significantly expanded with a total investment of 34 million euros. 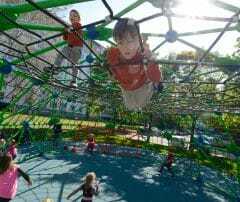 In addition to a crystalline park, the focus was on expanding the offers for families. 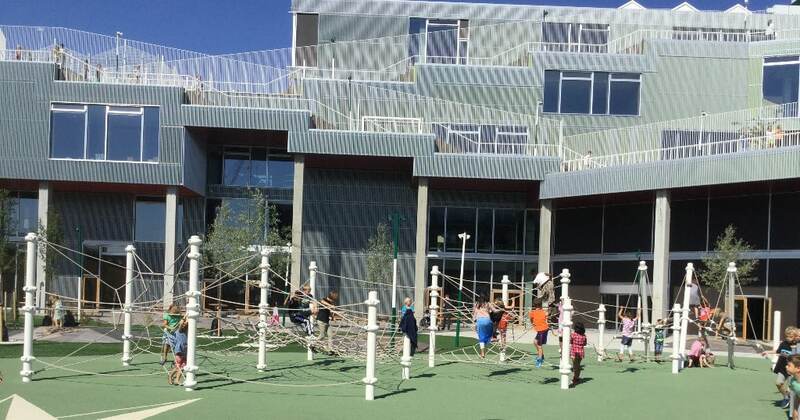 This was also the case for the playground tower - a 4-floor glass house. 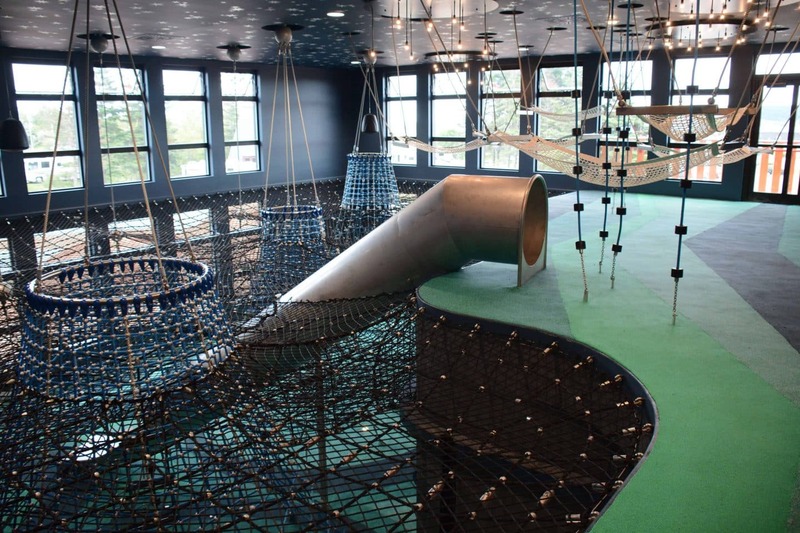 Various activities open up on the 4 floors, which are connected by a unique, 14-metre-high, three-dimensional climbing net. 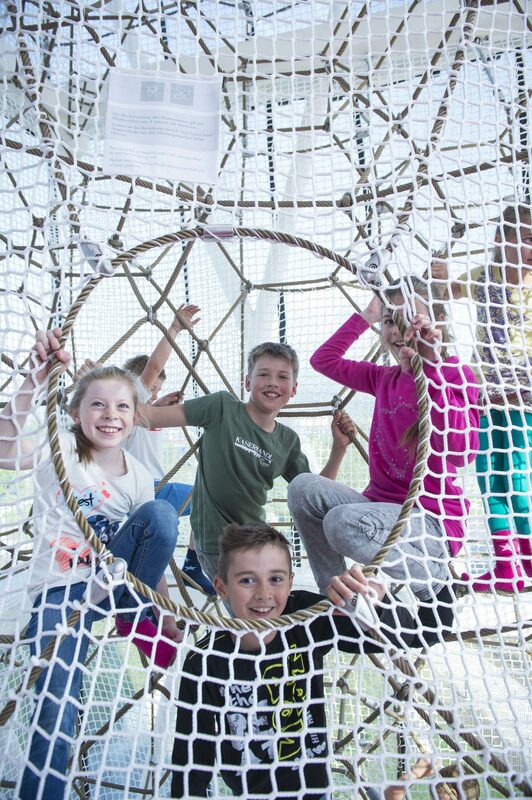 At 97 m³, the spatial net is the largest play structure in the tower and extends across all floors. 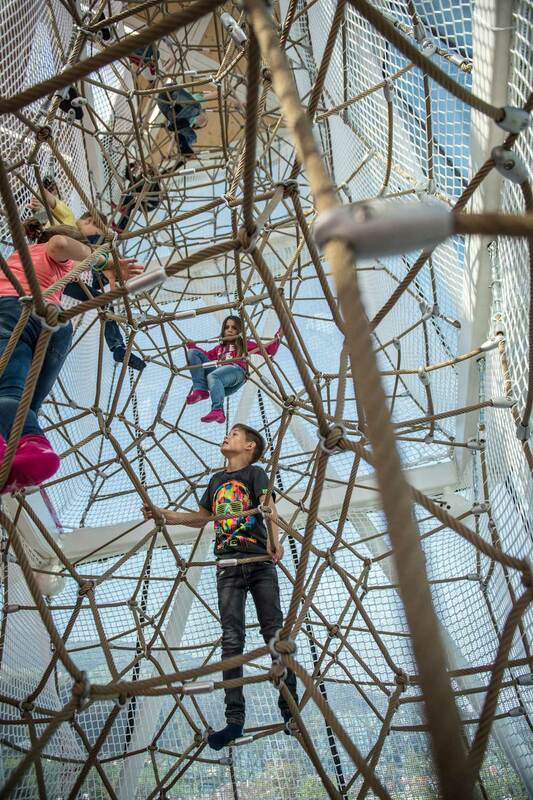 It is embedded directly in the building and is the largest spatial net ever installed indoors. Which handle next? - Three-dimensional thinking is required in the near-endlessly towering crystalline structure. In parts of the Lichtenberg district in Berlin between high-rises, the history of industrial housing construction is still clearly visible. 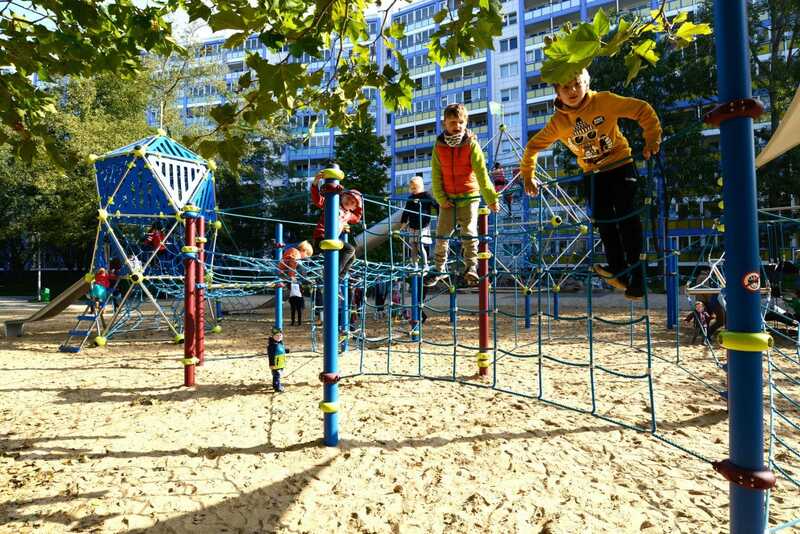 Up until a few years ago, Lichtenberg was not perceived very positively by many Berliners. 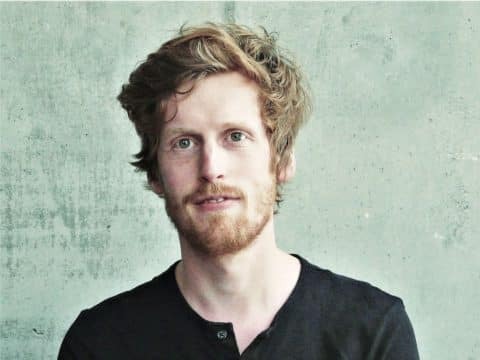 The mental connection of the district’s appearance to the bleakness of the GDR was too strong. Today, it is one of the most popular districts among people moving to the city. 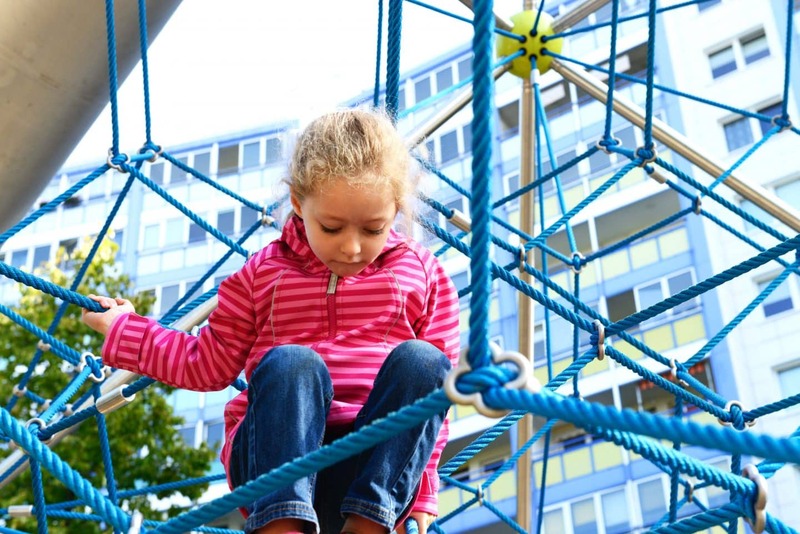 Especially families with young children are moving here. Local housing corporations are especially pleased by this trend. 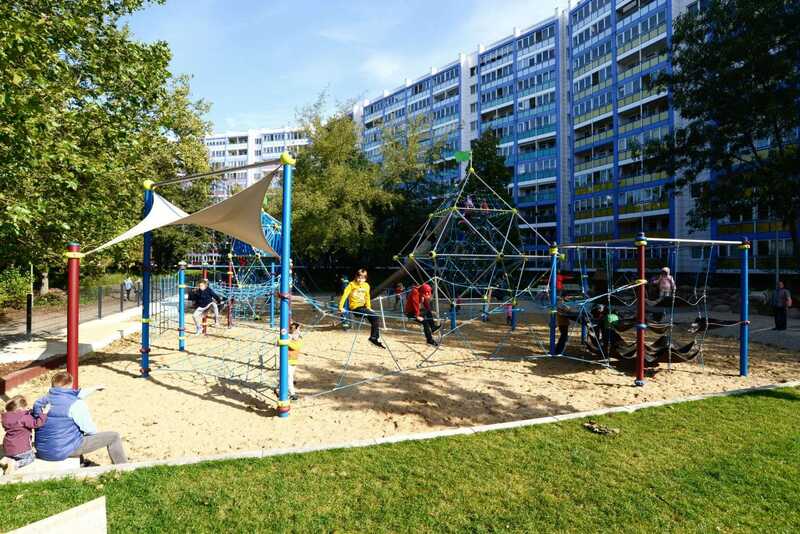 Berlin's largest housing corporation, the WGLi, has impressively created both a community garden and a playground in the form of a highly varied climbing landscape as part of the redesign of the outdoor area of an 11-storey residential complex. 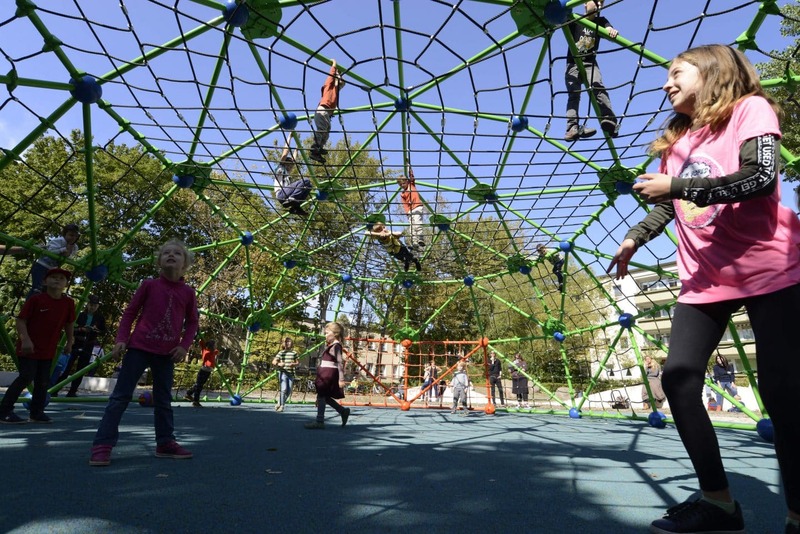 "With the playground in particular, we wanted to set a real highlight in the surrounding area," says Frank Gerasch of the WGLi. 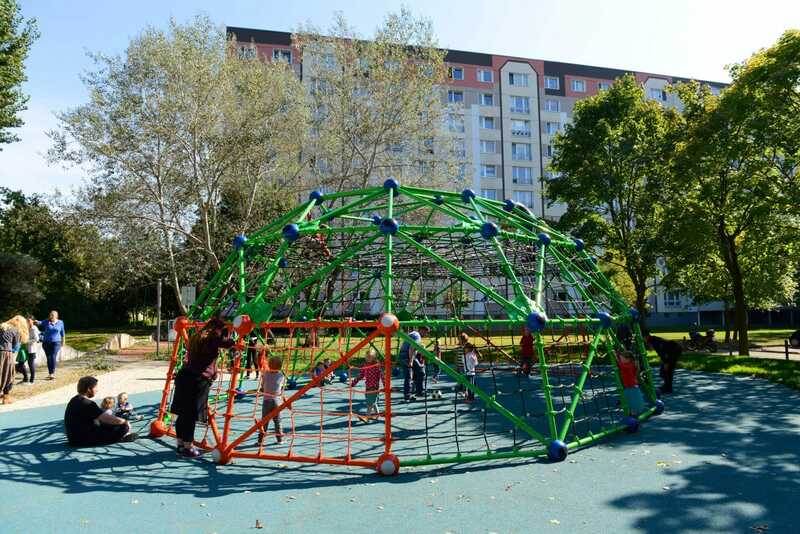 ...as well as a spatial net play unit (Jupiter), the outer framework of which is based on the shape of an octahedron. 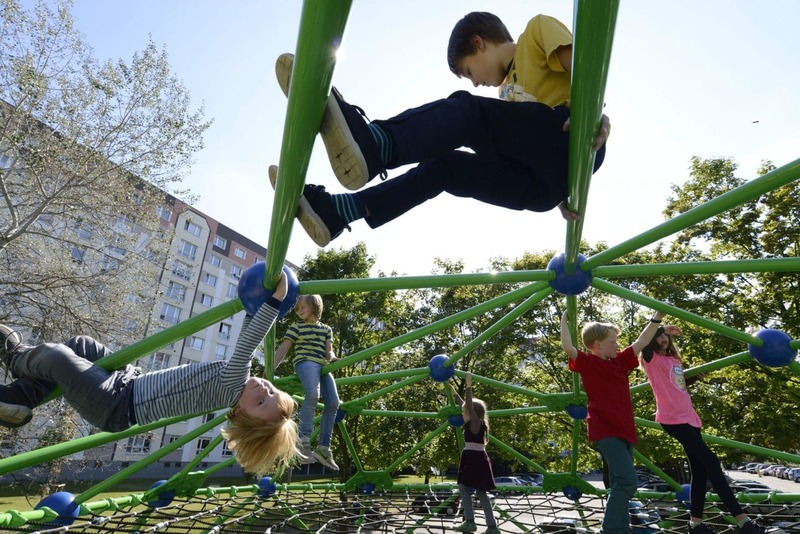 The device can be climbed up to a height of almost seven metres. The free fall height never exceeds the permissible amount. 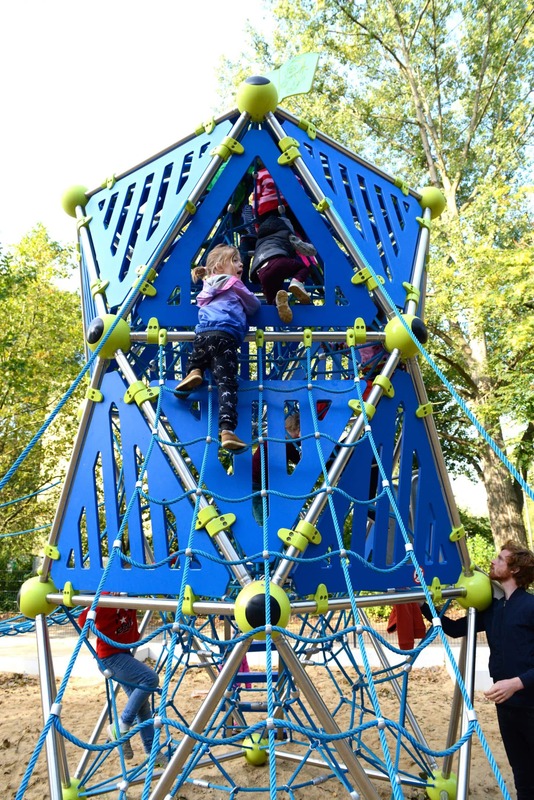 Thanks to the modular system of Berliner Seilfabrik, the two high play units could be connected to each other via a variety of different low rope elements in such a way that a self-contained climbing landscape was created. ... or slide down one of the two slides connected to Jupiter or the rope playhouse. 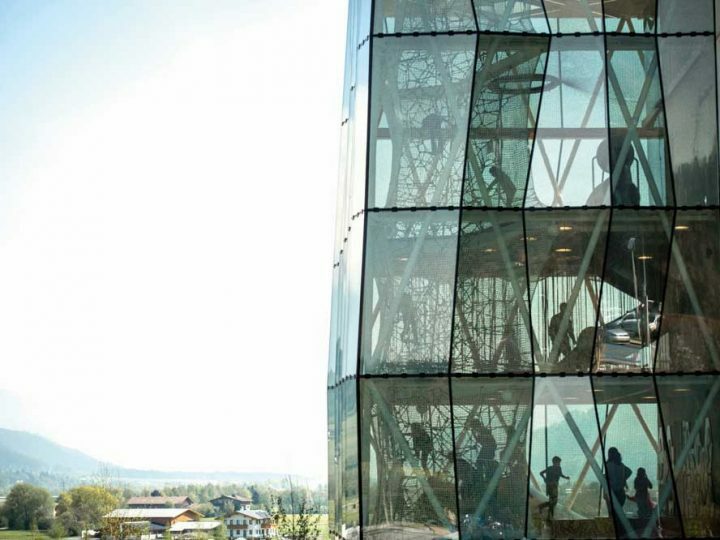 Visually, the newly designed climbing facility blends in perfectly with the surroundings. 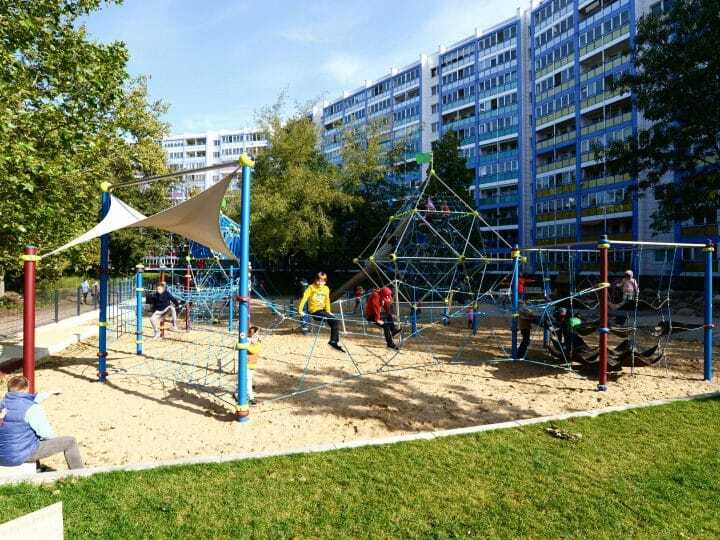 This is especially due to their colour design: blue ropes, posts and HDPE panels, silver-grey pipes and yellow system balls perfectly match the colouring of the façade of the residential complex. 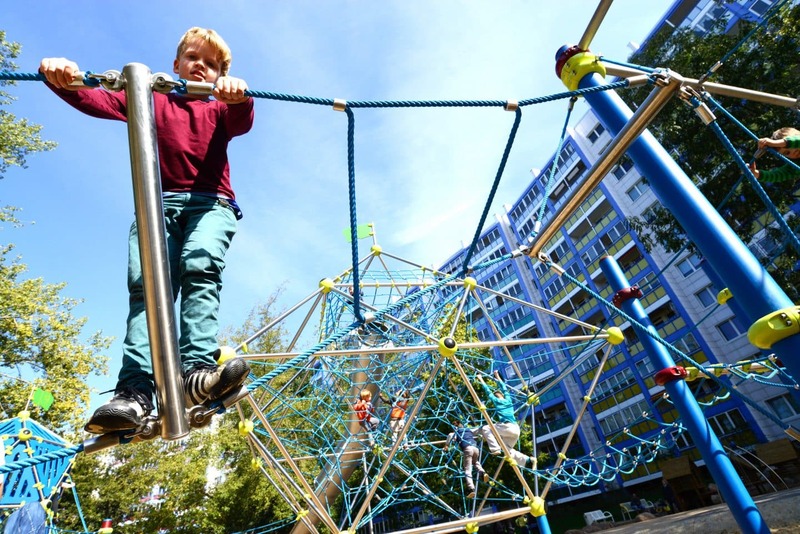 The leading landscape architect Mario Bobsien explains his idea for the design of the playground: "The appearance of the high-rise with partially glazed loggias in front of a blue sky and green meadow in the foreground evokes the association of a massive mountain wall in the mountains. We also picked up on this idea in the design of the exterior area, which lies like a mountain valley in front of the façade." 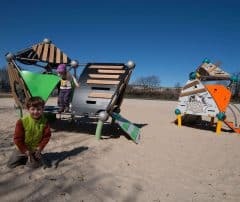 "We wanted the mountain character to be reflected in the play area, so we looked for play equipment that would involve challenging climbing or sliding down into the valley," Bobsien continues. 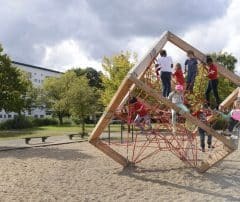 In Copenhagen‘s modern Sydhaven district, under the project management of the Copenhagen-based architecture company, JJW Architekter, new school grounds were built on an area of over 10.000 m2 - Sydhavensskolen. The whole building is arranged in tiers on five levels. 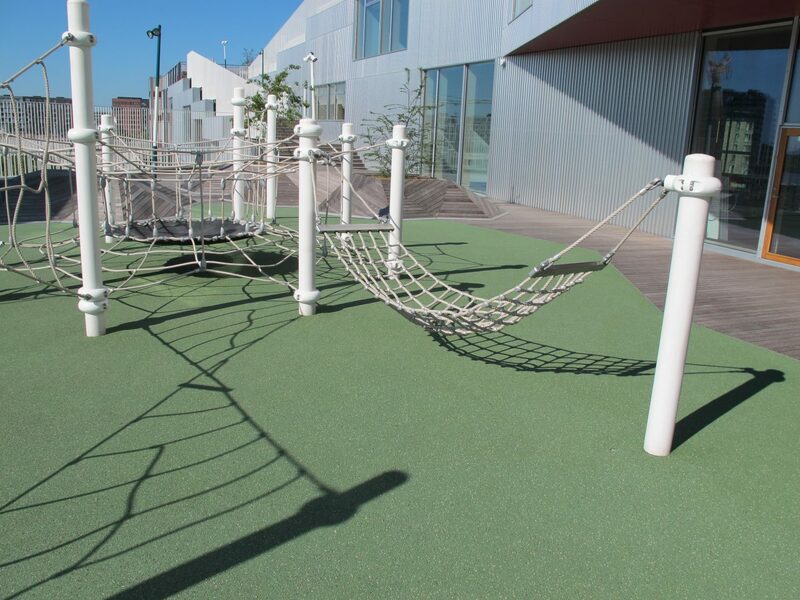 Each level has its own spacious area outside which can be accessed using spacious steps outside the building. 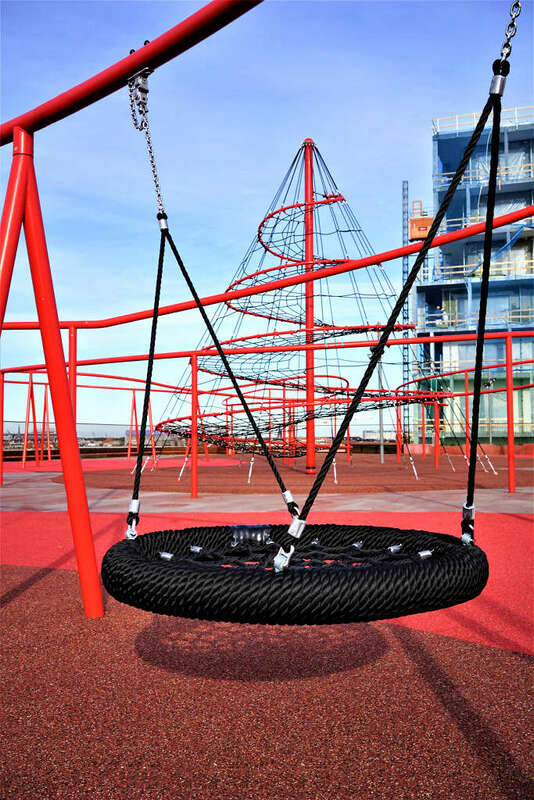 The different play facilities and the climbing apparatus on the individual levels are the core element of the areas outside. 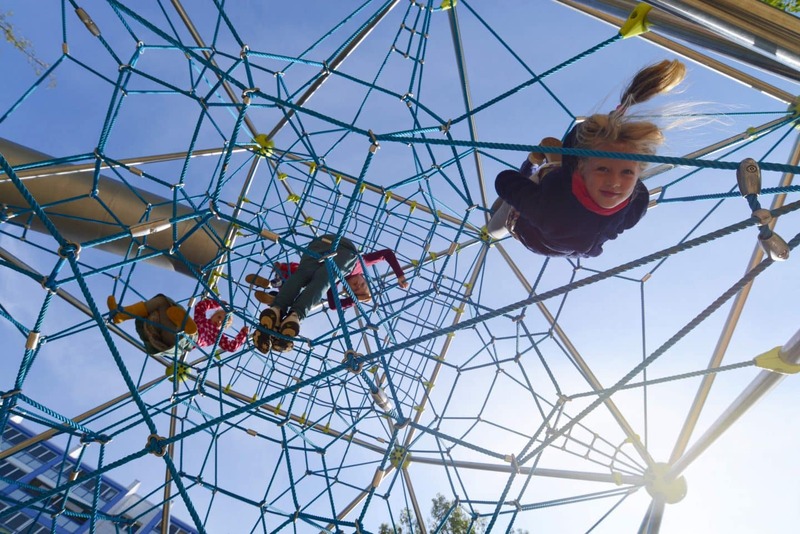 On levels 0, 1 and 2, playgrounds were created on areas of space measuring from 60 m² to 160 m², which challenge pupils close to the ground or up to a height of almost 3 metres. The architects decided on combinations for the “Terranos Netscapes”. 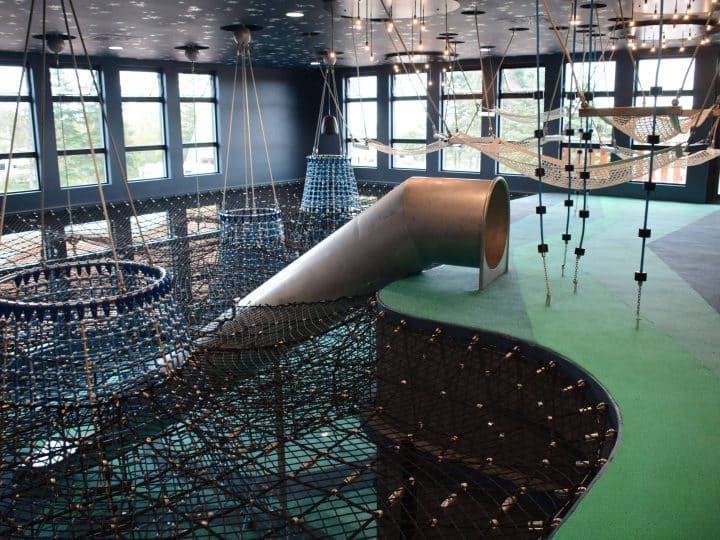 Ropes, nets, bridges, hammocks, rubber elements and other accessories are stretched here. 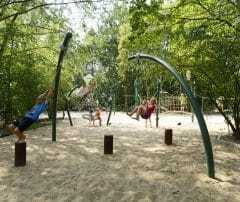 This creates new low-rope courses again and again. 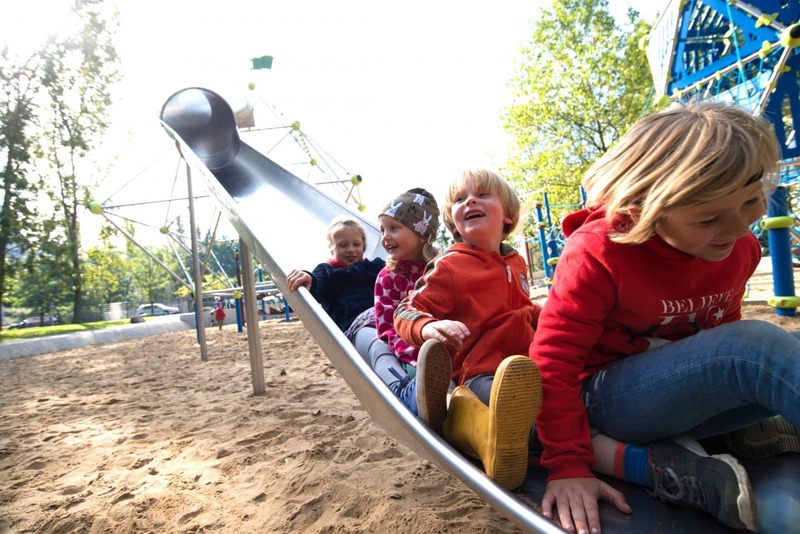 The common design language makes the individual play areas a unit. 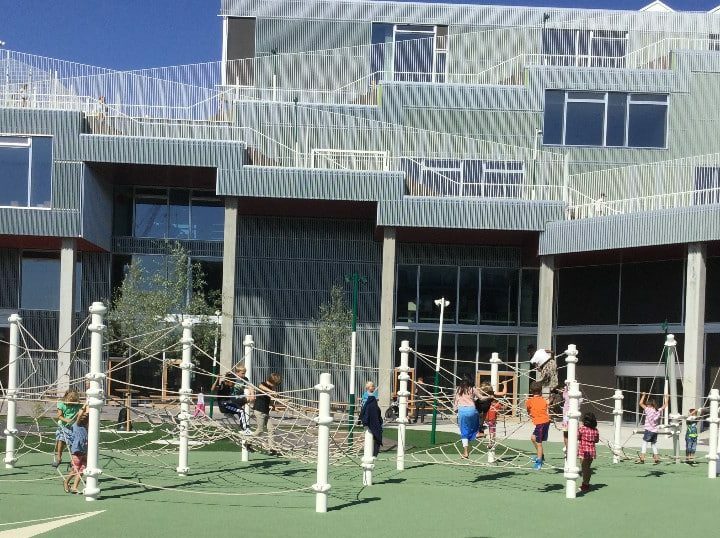 The ground of the Sydhaven project required a special installation, since it forms both the roof of the classrooms and the corridors. New School Ground in Sydhaven Therefore, it was not possible to use thick concrete blocks. 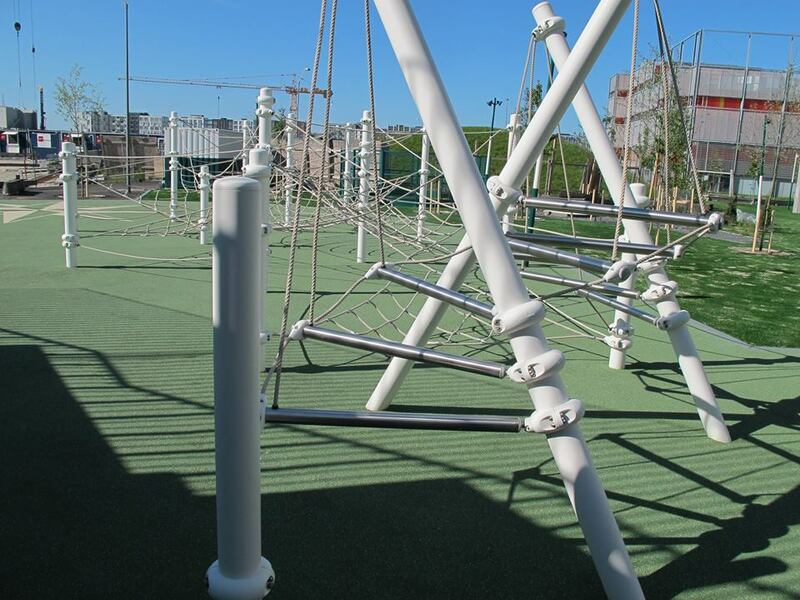 The posts were welded onto large steel plates and strengthened with gussets. These plates are firmly fixed on to the concrete surface with the help of shear connectors and thread bolts. 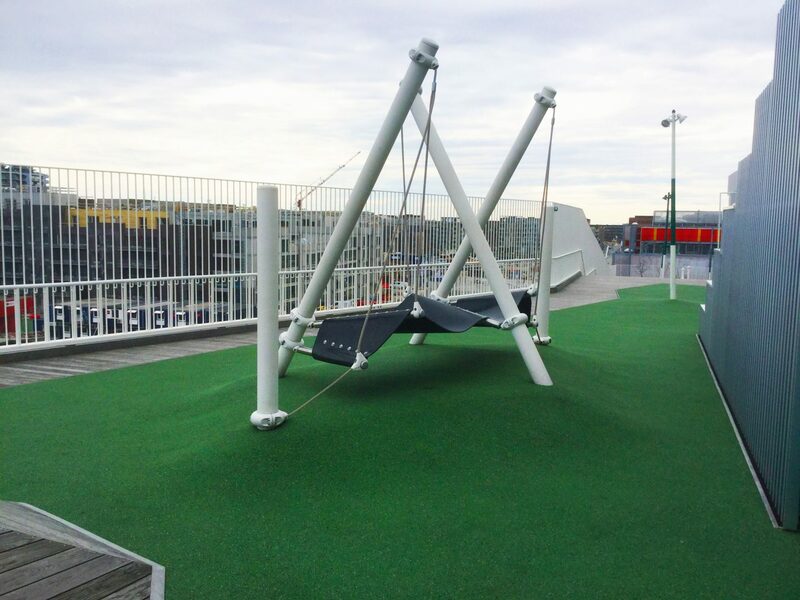 The bolts and plates are coated using coloured EPDM fall protection material. On the 3rd floor there is a smaller, but especially sculptural climbing element. 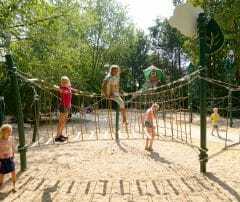 Between inclined and straight standing posts a rubber membrane spreads, which is attached to the posts with ropes. 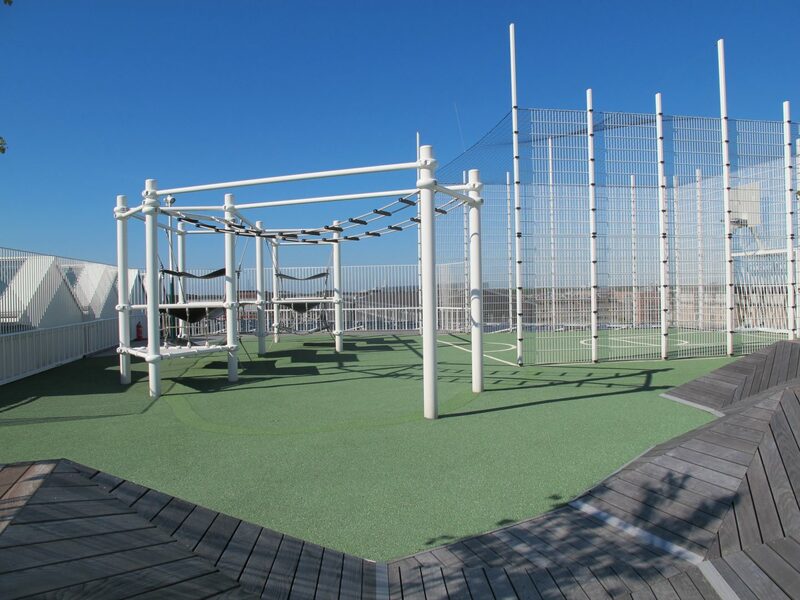 At the top level there are three sports and play areas. 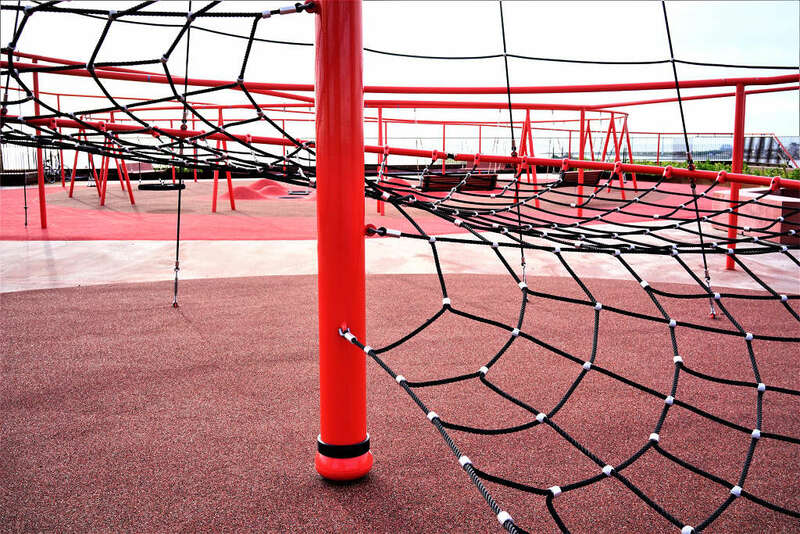 A kind of parcours leads the user to a nested field of rubber membranes. In addition, a streetball field makes basketball hearts beat faster.